After a busy July completing our Heritage Lottery Funded project World War 1: The Fight for Rights and Equality That Followed the Battles, we had a quiet August at Disability History Scotland. The Fringe, the Book Festival, the sun… we took time out to enjoy it all. Disability History Scotland is proud to highlight Bella Freak, a new multi-platform arts event devised and managed by disabled people. Bella Freak is due to launch in Edinburgh in July 2017, and will feature live music, performances by disabled and non-disabled artists, literary discussion and more. 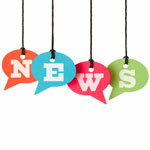 You can find out more about the organisation by visiting their website here and their Twitter account @BellaFreakOn. 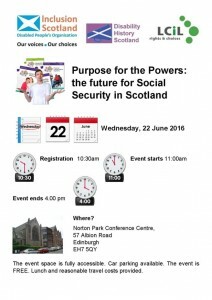 DHS is proud to announce Purpose for the Powers: The Future for Social Security, co-sponsored with Inclusion Scotland and LCiL (Lothian Centre for Inclusive Living). This event is your chance to have your say on the new social security powers transferred to the Scottish Government by the Smith Commission. 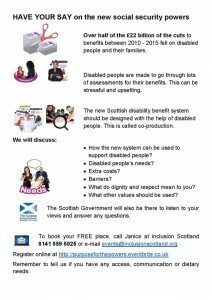 Purpose for the Powers will take place at the Norton Park Conference Centre in Edinburgh on Wednesday June 22nd. 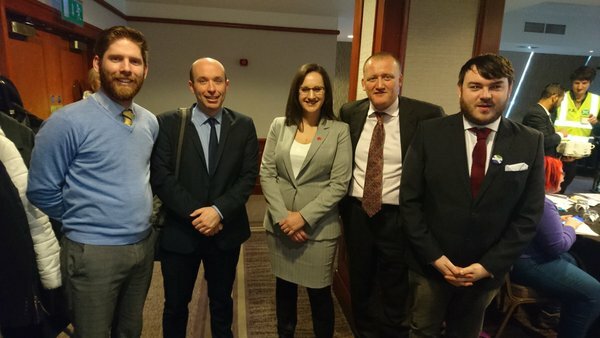 Disability History Scotland and Inclusion Scotland co-sponsored a Disabled People’s Question Time election hustings at the Macdonald Holyrood Hotel on Friday April 29th 2016.